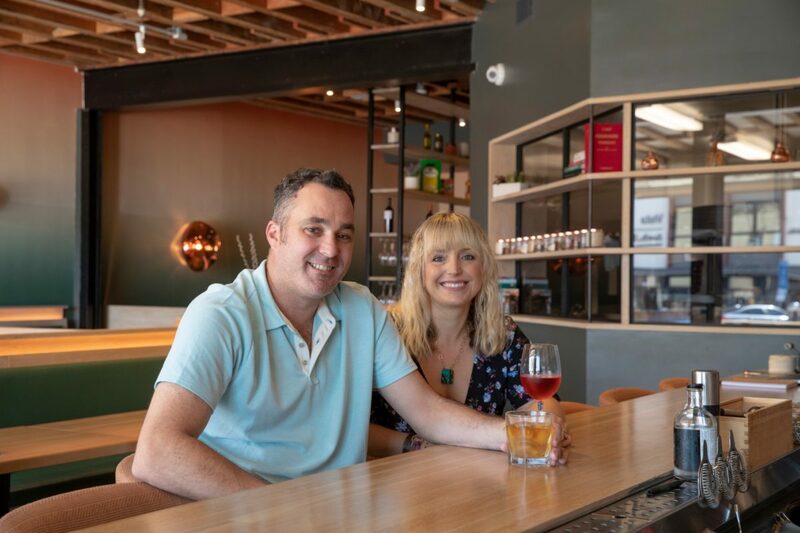 When Adam Aro steered his houseboat into the slip right next to Sara Gabriele’s houseboat one July day on Lake Shasta in 2008, he had little idea what would ensue, much less than ten years later he and this beautiful stranger would open up a restaurant together. Aro certainly had no inkling they would one day marry — he was against the concept, and it wasn’t exactly high on her list, either — and that he would join a culinary family seemingly concocted out of his wildest dreams. So it says something that the couple doesn’t recall their first shared meal. They were distracted. It was one of those strange, dizzying feelings in life where a story feels like it’s just beginning. They didn’t know it, of course, but this is where Gabi James began. Aro was five years old when he first started puzzling waiters with his food preferences. His parents, Joe and Eileen, were adventurous and knowledgeable eaters, and they’d take Adam along on their culinary forays all over the South Bay and to such regional landmarks as Philippe’s and Canter’s Deli in LA. Gabriele had a parallel experience with clams. She is the daughter of one of the great restauranteurs in local history, Guy Gabriele, who opened Cafe Pierre 40 years ago in downtown Manhattan Beach, three decades before the notion of “farm-to-table” dining took hold and the area became a culinary mecca. “People ask, ‘Are you a foodie?’ I mean, I guess technically, but I grew up sitting in the back table of Cafe Pierre coloring with my little sister,” she said. Her father grew up in France (by way of Tunisia and Italy; more on that later) and the family would visit there yearly, beginning and ending their travels in Paris. When Sara was six and her sister Melissa three, they accompanied their parents to a Michelin-starred restaurant in Paris. In their early childhood, Sara and her sister were both known as “the garlic kids”; they’d come to school with a packed lunch containing a bowl of pasta and garlic. Aro went to college at the University of Oregon, in Eugene, where the cloistered world of Palos Verdes gave way to a broader range of everything — people and foods from all over the globe. Oregon also offered two other tastes that were new to him: Oregon was the birthplace of the craft beer movement, twenty years before it reached California, and home to some of the great Pinot Noir wines in the world. Gabriele went to school at the University of Colorado in Boulder, where she was shocked at what passed for a meal at the dorms. So she researched the local food scene and started organizing dinners out with her classmates. Adam and Sara each ended up back in the South Bay after college. Aro had majored in psychology and minored in French, but discovered his real passion in working in restaurants in Eugene. 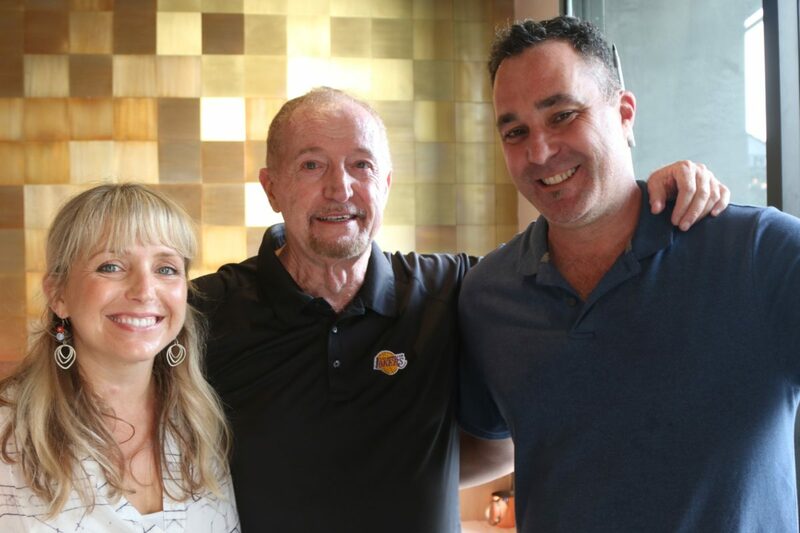 He was part of the original staff when Rock n’ Fish opened in downtown Manhattan Beach, where he not only learned about bayou-tinged cuisine but was allowed to give input on the wine list. Gabriele majored in communications with a minor in business administration but worked as a hostess at Cafe Pierre during summers in college and felt a gravitational pull to the family business. After college, she worked both there and at her father’s newer restaurant, Zazou, in Redondo’s Riviera Village. She did a few other things — bartending and catering at the Bel Air, then teaching preschool — before returning for good to become general manager at Zazou. A few miles up the beach, in Hermosa, Aro’s trajectory mirrored his future wife’s. He started as a server at Mediterraneo, on Pier Avenue, in 2006, and quickly moved up, eventually becoming general manager. The two were on course. One of Guy Gabriele’s most enduring memories, and one that would later have a profound influence on the rest of his life were the Sunday afternoon dinners he experienced as a child. He spent the first 15 years of his life in Tunisia. When Tunisia gained independence the Europeans were all kicked out of the country. Gabriele and his family spent three years in a refugee camp in Italy. His immediate family relocated to France when Gabriele was 18, first to Nice and finally Toulon. Food remained at the center of family life; his father opened his own butcher’s shop and made charcuterie and prepared meals, no trivial matter for daily life in France, where each day revolves around the meticulous curation of its meals. Guy emigrated to the United States to study comparative literature at UCLA, where he would obtain his master’s degree — possibly as the only student working his way through school as a part time butcher. But he inexorably gravitated toward restaurant work, working as a waiter at several restaurants and eventually opened up Cafe Pierre in Manhattan Beach. It was 1977 and fine dining in America hadn’t evolved much beyond steak and potatoes. Gabriele and chef John Sedlar, who’d opened up the pioneering restaurant Saint Estèphe in the Manhattan Village Shopping Center, were lonely outposts of culinary adventurism in downtown Manhattan Beach. Cafe Pierre would last 37 years — becoming Love & Salt, a restaurant launched by Guy and his eldest daughter, Sylvie, in 2014 — and become a beloved local institution. Food critic Richard Foss, a Manhattan Beach native who has written about South Bay restaurants for four decades, said what was remarkable about Cafe Pierre is it didn’t simply pioneer in one area — say, farm-to-table or authentic Italian pasta — but across several concepts. But perhaps more than anything Cafe Pierre became known for the warmth, charm, and understated brilliance of its owner. Gabriele, who early on would often work 20 hour days, sleeping in his car out behind the restaurant before rising to help with prep work, has a gift that cannot be taught. In the restaurant industry, it’s called “running the floor”; in life, it’s called omnipresence. From the time she was a child until now, his daughter Sara has marveled while watching her father’s graceful movement through a restaurant. This gift flows from a simple source. Like his aunts six decades ago in Tunisia and Italy, Gabriele feels a sense of responsibility for the well-being of anyone who sits at one of his tables — not just that they are well-fed, but happy. A great idea is often marked by a certain sense of inevitability. A hit song, for example, somehow sounds like you’ve already heard it, even though it may have just been written. Great restaurants are much the same. Circumstances must somehow align. A particular chef arrives at just the right time and place, where a certain clientele is waiting for something they didn’t even know they were missing, and suddenly a kitchen and a dining room spring to life like some kind of culinary symphony. Gabi James is such a congruence. Named for Sara’s family surname and Aro’s middle name, Gabi James is the joint creation of the couple and replaces Zazou, in Redondo Beach’s Riviera Village. It’s a casual Spanish restaurant at which they’ve managed to nab a rising star chef, Chris Feldmeier (who started at the famed Mozza restaurant) and obtained the services of beverage director Vincenzo Marianella of Copa d’Oro and Providence repute. Aro has a gift akin to Guy Gabriele’s. Customers at Mediterraneo came to expect his appearance at their tableside, regardless of who was actually serving them. If you’d been there before a few times, he already knew your palate, particularly regarding beer (Aro is a cicerone). Some customers ceased even specifying their beer ordering — they’d just give him a general idea of what taste they were feeling like and he’d arrive in a few minutes with an uncannily perfect brew. Sara herself has a gift, her wine palette, that mystifies even her father, who was the first local restaurateurs to host wine dinners and has been friends with some of most revered winemakers in California, such as Mike Grgich, since the 1970s. After the couple’s houseboats converged and they returned to the South Bay a couple, they naturally began collaborating with food ideas. After he began running the show at Mediterraneo, he started pushing the envelope. Sara still swoons when she thinks of Adam’s take on bacon wrapped dates. Feldmeier grew up in Torrance before leaving at age 18 to become a chef, something that occurred in part because he’d grown up having his mind blown, and his palette developed, at Cafe Pierre. Feldmeier worked under the tutelage of Mozza’s Nancy Silverton, who runs her restaurants like one big family, and later opened his own restaurant, Moruno, which focused on Spanish cuisine. Mozza’s fare was Italian and Moruno was inspired by his own travels in Spain. And Gabi James is indeed like an extended family. Manager Victor Salcedo has been with the Gabriele family since 1982, when he started as a busboy at Cafe Pierre. He looked after Sara when she was a tiny child, and watched her grow up to become a server and a hostess and eventually general manager at Zazou. “Now she is my boss. I work for her,” he said, laughing. On nights when Adam goes home early, Salcedo sometimes walks his boss out to her car, looking after her like he did when she was a little girl at the old restaurant. “She is like my daughter, you know?” he said. Later, when Salcedo’s father passed away, he told Guy he’d have to go to Mexico for a little while, worried that his boss would be upset by his absence. Instead Guy pulled out his credit card and bought the plane ticket on the spot. He called Victor several times when he was gone, making sure he and his own family had everything they needed. “Those kind of things really make you appreciate the fact that this is a family, not only a business,” Salcedo said. And Guy himself remains involved at Gabi James. He has no formal title. He shows up on any given night, but one senses it’s not only about making sure the customers are happy. He is a very proud father, and he loves his son-in-law. And so Gabi James has begun, the latest chapter in a longer tale, with Adam and Sara at the helm of a journey that began by houseboat.